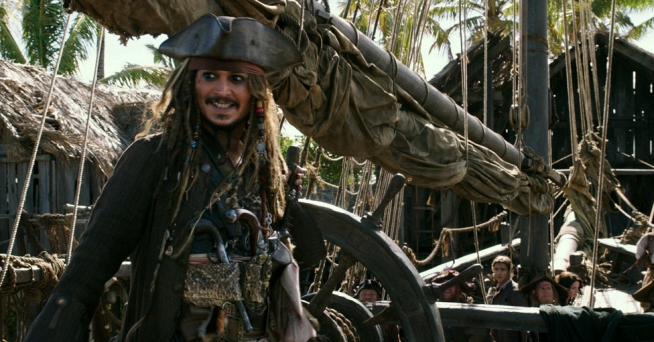 The first Pirates of the Caribbean movie is a summer blockbuster classic. I stand by that. It is way better than it has any right to be and Johnny Depp’s Jack Sparrow was such a fantastic character the first time you saw him. However, that is the issue with these movies, they started off great but the movies get progressively worse. The second entry Dead Man’s Chest is a pretty decent follow up to the original but The World’s End is an utter mess. I honestly remembered very little about On Stranger Tides so I went back to watch it this weekend and found it to be stale and frankly, boring. Dead Men Tell No Tales picks up several years after the events of the original trilogy that featured Orlando Bloom and Keira Knightley. We know this because we are treated to some flashbacks early on to establish that Will Turner (Bloom) is still cursed to live aboard the Flying Dutchman after having his heart cut out at the end of World’s End. The setup of this movie is, like I said, needlessly complex. Will’s son, Henry, played by Brenton Thwaites who is actually quite good in this role has made it his life’s mission to break his father’s curse by learning of every myth of the sea. He knows he needs to find Jack Sparrow to do so. Why? Because Johnny Depp is signed on for this film. On a nearby island, Kaya Scodelario plays Carina, a young woman who is accused of being a witch because she can read and is an astrologist. Carina has a book that was left by her father and it is her mission to use that book to read a map and discover an ancient myth that can break all the curses of the sea. Meanwhile Jack Sparrow and his lovable gang of misfits have been getting by stealing from banks despite being the only pirates without a boat that actually floats. Geoffrey Rush as Captain Barbosa is the wealthiest pirate in the World and runs the entire sea from some sort of gaudy pirate ship floating headquarters. Henry is aboard a British ship hunting pirates when they follow said pirates into the Devil’s triangle. The Devil’s Triangle is where Captain Salazar’s ship of Ghosts is trapped and Salazar kills everyone on board EXCEPT Henry so that Henry can tell the tale of the attack. Salazar also asks Henry to deliver a threat to Sparrow if he ever finds him. 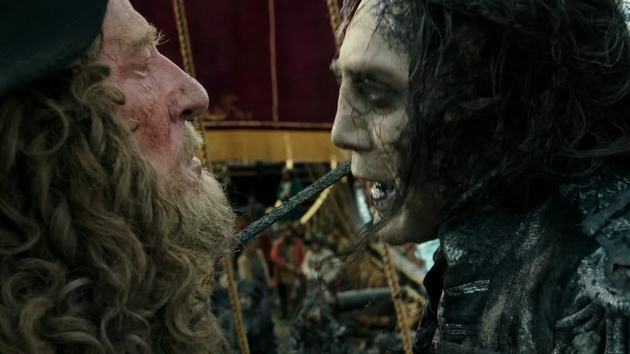 Apparently, the only way for Salazar and his ghost pirates to escape Devil’s Triangle is for Jack Sparrow to abandon the magical compass that he’s had since the first movie. Conveniently, Jack Sparrow runs out of gold and trades the compass for a bottle of rum. Salazar then escapes the Devil’s Triangle and begins killing all ships on the sea as he hunts Sparrow. Like I said, needlessly complex. We get team ups, bargains, deals, escapes, twists, turns, reveals, etc. for the next 90 minutes as all the characters mentioned above and several new ones all compete to find Jack Sparrow and find the Trident of Poseidon to take control of the sea. During the adventure there are some downright great comedic action sequences. There is an escape gag involving a guillotine that is so inspired and perfect that I want to shake the hand of whoever came up with it. A pirate’s version of the safe heist from Fast Five doesn’t disappoint either. The special effects for Javier Bardem’s Captain Salazar and his crew are top notch and hover on the border of disgusting for a PG-13 movie. A scene with ghost sharks is something I never knew I needed until I watched it and the finale was executed really well because by then we were down to two teams to follow instead of 5. The newcomers to the series really did a good job. I feared they would just be facsimiles of Keira Knightley and Orlando Bloom and as plot devices they were BUT they were fresh characters with enough differences to justify their addition to the tale. Javier Bardem was extremely creepy and by far the most menacing villain of the series and I wish we spent a little more time with him. As for the old regulars, Geoffrey Rush was great as usual and I really enjoyed Depp in this one. I have been off the Depp train because I’m kind of sick of his shtick and even though he goes back to this character again, it is still a joy to watch him do some of the physical comedy and great line delivery this character demands. Pirates is a cash cow for Disney and I expect to see one of these every 2-3 years for quite a while. I don’t want to say I didn’t enjoy this movie because there were parts that I truly loved but I will probably never see it again unless one of my kids gets into a pirate phase in a few years. There is a point where the complexity and plot gymnastics to get all these characters together feels like a chore and my breakdown above doesn’t even encompass everything it took to get the story moving! But when Pirates succeeds with action and storytelling it truly soars to incredible heights and is such an entertaining joy to watch. In this pirates movie the peaks are the highest of highs and the lows border Davey Jones’ Locker. This entry was posted on Tuesday, May 23rd, 2017 at 10:57 am	and is filed under Film, News. You can follow any responses to this entry through the RSS 2.0 feed. You can skip to the end and leave a response. Pinging is currently not allowed. But the end credits scene, I felt, was worth the watch altogether! « Opposites Attract Ep. #1 – The Shallows, Beauty and the Beast (2017), Alien: Covenant!